I just upgraded from JBoss 4.0.3SP1 to 4.0.4.GA and now when I set the JBoss plugin to use the new version of JBoss, I get the error "Invalid Server Instance" (I set it to 'default', which is the only choice). Is this a bug in the JBoss plugin? Is there a workaround? I had previously been using the JBoss plugin with JBoss 3.2.6, 3.2.7, and 4.0.3SP1 with no problems. Works for me 4.0.4GA with all configuration. What versions of IDEA and plugin are you using? And how did you install JBoss? By unpacking the archive file or by using the installer with support for EJB3? I have jboss-4.0.5GA installed with it's installer with EJB3 support. When I try to deploy or stop server i get exceptions (see attachment). 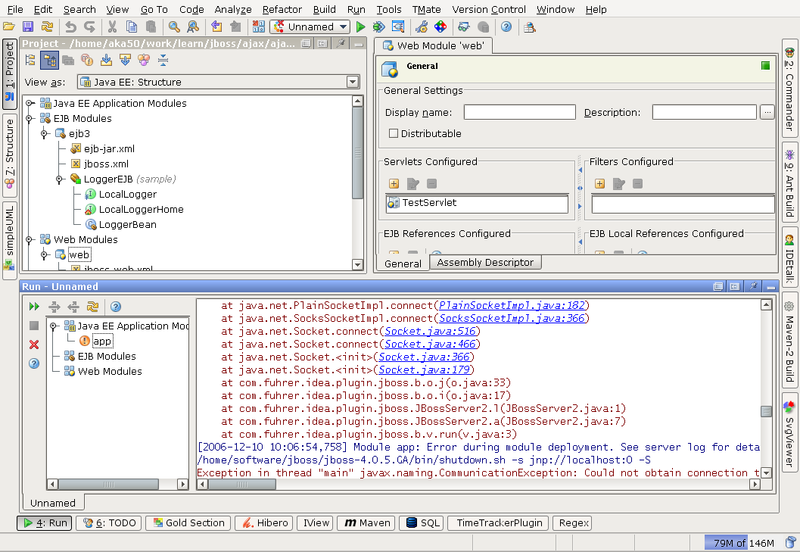 ejb3/web project and jboss start/deployment/stop. This will be very helpfull. You are using an outdated version of the JBoss plugin. Please remove it and use the one distributed with IDEA. I found old plugin. Without it all work as a charm.